One of my favorite takeout Thai items is basil chicken. It is basically minced chicken stir fried with basil. I wanted to do something similar, but with beef. This is my take on that dish. 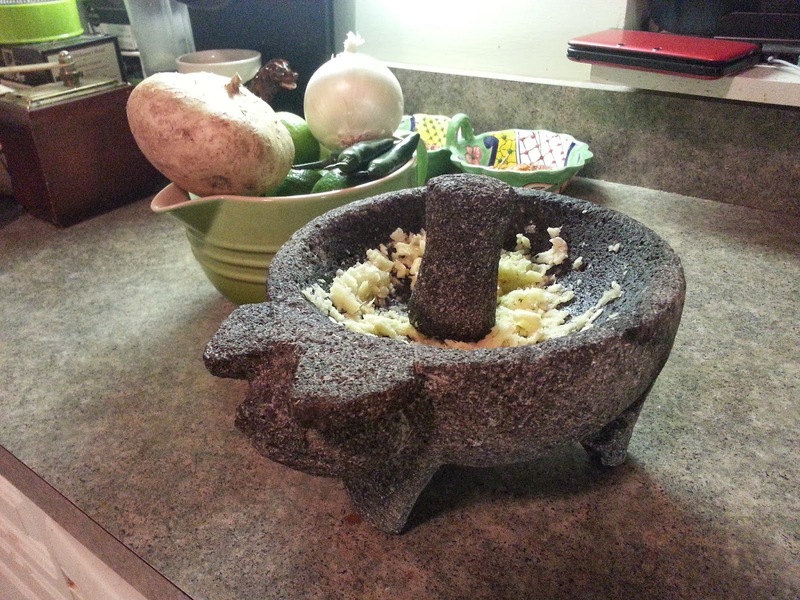 I began by smashing garlic and ginger in a molcajete. 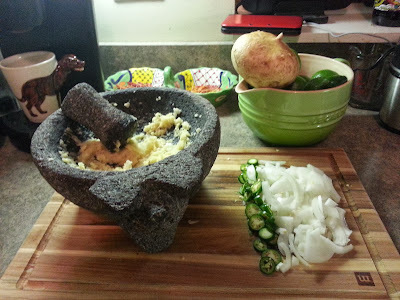 I added 6 garlic cloves and about .25 cups of chopped ginger. I also cut one white onion into fourths then cut into slices. 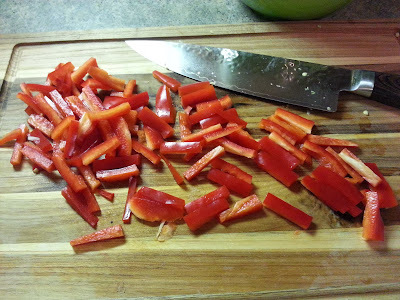 I also cut 2 serrano chiles into slices. 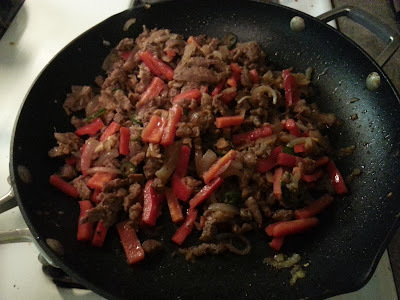 I imagine any vegetable would go great with this but I like red pepper with spicy beef and ginger. I cut it into little sticks so I can easily saute it with the sliced steak. I began to cook my ingredients by first heating a pan on high and adding oil. 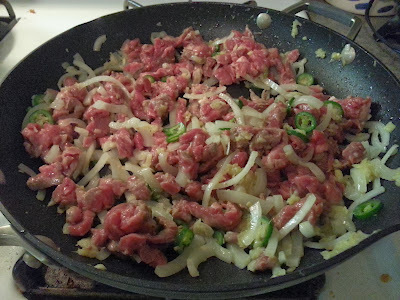 I first added the garlic and ginger to cook for a minute before adding the onion and chile. Finally, I added sliced chuck steak. Any cut would do but I find that this has a lot of flavor and goes well in a quick saute. 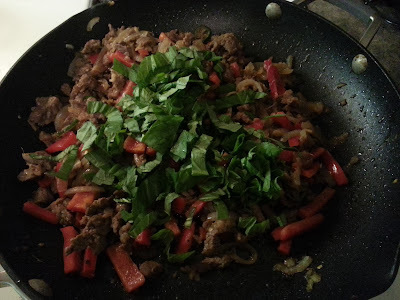 Just as the steak was browning I tossed in my red bell pepper to keep a bit of the crunch. I switched the heat to low and added a handful of chopped basil. I tossed this until it wilted and mixed in with the rest of the ingredients. This was the final result. 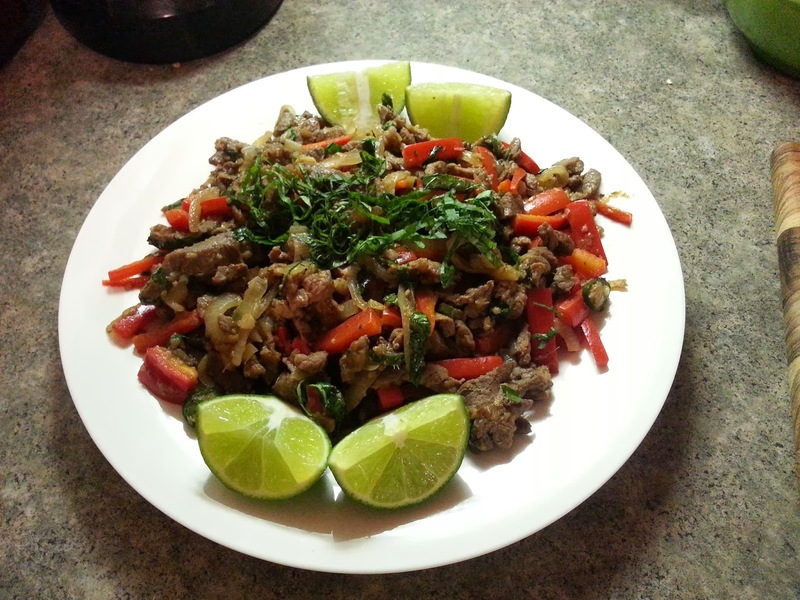 I topped with some fresh basil and added a few lime wedges which I love with most spicy Thai dishes. This was a quick recipe for a weekday that I served over steamed brown rice, taking less than 30 minutes to complete. I did not follow a recipe but I'm going to try adding some lemongrass next time to see how it impacts the overall flavor.